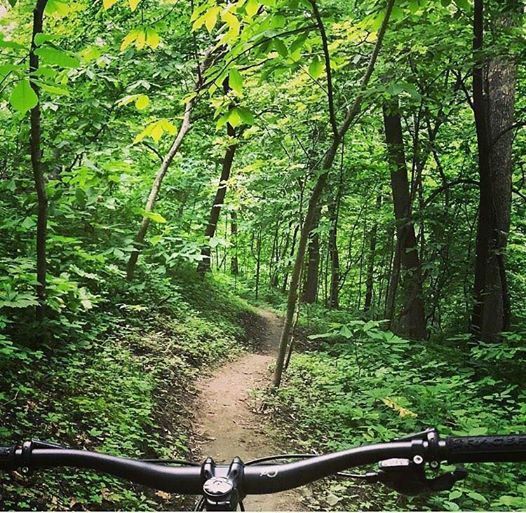 This is a short, three-mile trail in the Northland of Kansas City. It is a relatively easy trail winding around a nice Valley with beautiful scenery and a few short, steep uphills and fun sections to practice cornering skills. This system is great for the beginner to intermediate rider that has the MTB bug. Great for advanced riders as well, you just need to ride it faster or on singlespeed and it becomes a very challenging course. Over all the trail system is fast and flowy. There are about 2 miles of moderate tech trails and the rest just flows and prompts for fast riding. The entire trail system can be ridden in one big loop which is 11.4 miles in length. Go right and stay right or go left and stay left to cover the entire system without much navigational error. I nice mixed trail system to get away from the big city for a day. Camping and a lake available for additional fun. Also known as green hills trail. This Ffn trail system follows the valleys around the lake. Ten miles one way Twenty out and back. Fun compact system with plenty of “features” to enhance your fun.